Preston was a private in his mid-20’s when he arrived at Montford Point in Jacksonville, North Carolina, a segregated training camp for African American Marines. 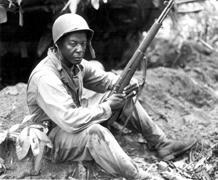 Prior to 1941, African Americans weren’t allowed to enlist in the military. But as American involvement with World War II became a real possibility, there was a sudden need for jobs in the defense industry. Deputy Director of the National Montford Point Marine Museum Houston Shinal says President Franklin D. Roosevelt issued a directive on June 25th, 1941 that that sought to erase discrimination in the Armed Forces. Roosevelt’s executive order was the first Presidential decree issued on race since Reconstruction. The directive required the armed services to begin recruiting and enlisting African Americans, including the Marine Corps. In 1942, the first black Marines were sent to Camp Montford Point in Jacksonville where they trained separately and away from their white counterparts. While white Marines were sent to traditional boot camps like Parris Island in South Carolina and San Diego, California, Montford Point was exclusively for African Americans. Shinal says many of the black Marines didn’t know they were heading to a segregated training facility. During the early years of Montford Point, white drill instructors were in charge of training the young recruits. By 1945, all of the drill instructors at Montford Point were replaced with African American instructors that Shinal says were tougher and pushed them harder. 91 year old Norman Preston remembers the intense training. He says his African American drill instructor pushed him to his limits because he understood what they had to go through. Montford Point Marine Norman Preston never saw a combat situation. He was deployed overseas to Pearl Harbor to help with the troop drawdown in the South Pacific. He says he didn’t really experience segregation or discrimination there, but white marines did set him up for embarrassing situations. In 1974, Camp Montford Point was renamed Camp Johnson to honor Sgt. Maj. Gilbert "Hashmark" Johnson who one of the first African Americans to enlist and serve as a drill instructor in the Marine Corps. Now, Camp Johnson is home to the National Montford Point Muesum. Currently, the 9mm anti-aircraft gun is on display at the museum, but will be relocated to the Montford Point Memorial that’s being constructed at Camp Johnson’s front gate. The museum also includes a variety of photographs, documents, papers, and artifacts that preserve the legacy of the Montford Point Marines. However, no object or artifact can capture the courage, strength and dedication of the Montford Pointers except the men themselves. Many of the Marines have passed away, some of them are still here to share their stories of bravery in adversity. 91 year old Montford Pointer Norman Preston…..
Preston was among 400 Montford Point Marines that were awarded the Congressional Gold Metal- which is the country’s highest civilian honor - in 2012. If you’d like to visit the National Montford Point Museum, it’s located in the East Wing of building M101 aboard Marine Corps Base Camp Johnson. The museum is open Tuesdays and Thursdays from 11 to 2, and 4 to 7:00 pm. And on Saturday, it’s open from 11:00 am to 4:00 pm. For more information, visit montfordpointmarines.org. I’m Jared Brumbaugh.